Just about everyone has seen silver strips of duct tape holding together old furniture, wrapped around pipes or used when standard-issue clear or masking tape isn’t strong enough. But Duck Tape brand wanted to show that its product could be more than functional; it could fashionable and fanciful as well. So shortly after the tape played a starring role in the Unconventional Materials Challenge on season 11 of the TV series “Project Runway,” Duck Tape and agency Pro Motion opened a pop-up shop one block from Times Square in Manhattan. Prior to the shop’s opening, members of the media were invited to a luncheon and fashion show in which models strutted down a catwalk wearing the “Project Runway” Duck Tape dresses. After the show, the models ventured out into Times Square, figuratively if not literally stopping traffic and even heading down to the iconic TKTS bleachers to chat with people waiting in line for Broadway tickets. The shop’s floor-to-ceiling windows were filled with strips of Duck Tape in an unexpected array of colors and patterns, as well as the “Project Runway” dresses. Inside, beyond the giant Duck Tape purse, visitors could shop from the racks of the more than 200 styles offered by the brand and admire accessories and artworks fashioned from them. Special events during the 12 days that the shop was open included a chance to meet some of the “Project Runway” designers, view how-to craft videos, and watch an artist create the New York skyline out of the tape. 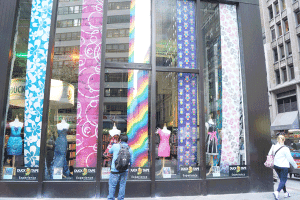 More than 15,000 New York residents, commuters and tourists visited the pop-up shop, buying more than 10,000 rolls of tape. The campaign generated more than 37.5 million media impressions. And we’re sure more than a few people received gifts of wallets, hairbands, place mats and other items made by family and friends who were inspired by the event.